Environment Canada has issued a Special Weather Statement due to predictions of high rainfall amounts this evening to Monday morning. Forecasts predict the region could see up to 50 mm, with the potential for locally higher rainfall amounts due to thundershower activity. Environment Canada’s Marine Forecast has a Strong Wind Warning in effect for Western Lake Erie due to predicted winds between 35 and 55 km/hr from the southwest during this period as well. The Marine Forecast is currently predicting modest wave heights of 1 m. The heaviest rainfall and strongest winds are currently predicted for Sunday evening. Should the large predicted rainfall amounts appear, local watercourses should be expected to rise and some could spill their banks. There could also be localized flooding simply due to the heavy rains. If excessive rainfall amounts appear, the Indian-McGregor Creek Diversion Channel may need to be operated. The lower end of the predicted wind speeds and wave heights are not typically associated with damage along the Lake Erie Shorline. 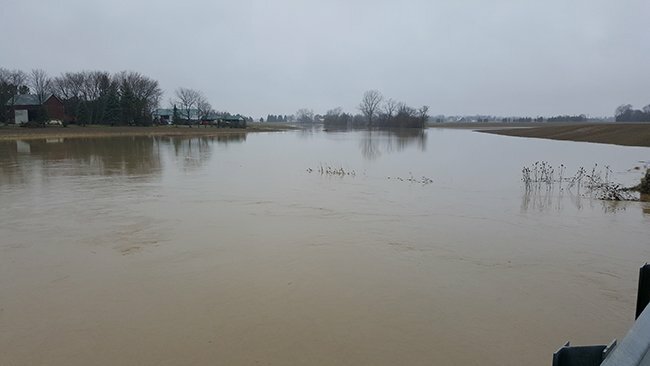 However, we have seen instances of flooding along Erie Shore Drive in Chatham-Kent earlier this year with winds around those levels. The higher predicted wind speeds are more typical of what has caused flooding and damage to the Lake Erie Shoreline earlier this year. Residents along the Lake Erie Shoreline should be aware and pay attention to local conditions. Homeowners should secure their properties and try to ensure that catchbasins and other drainage works around their properties are clear and free of debris that could block them. People should take extra caution and avoid the river, ditches, streams and shoreline. The combination of slippery banks, waves and/or fast flowing water can be dangerous. There could also be hazardous debris within the water. Standing water can also present its own unseen hazards. Children, pets and livestock should be kept away from the water. This message will be in effect until November 7th, 2017. Contact: Jason Wintermute (jason.wintermute@ltvca.ca or 519- 354-7310 x227) regarding this message.